As the issue opens, the Shredder launches a pyschic attack against Master Splinter. The Turtles’ Sensei is stricken and shocked, but launches a counter attack that frees him from Saki’s mental trap. Shortly thereafter, the Shredder calls his Foot Clan to battle, stating that the time is ripe to assault their weakened foes. 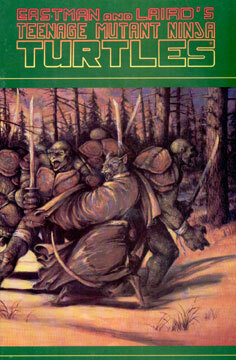 Master Splinter is shaken by the psychic attack and the Turtles themselves are in hibernation during the winter season. Meanwhile, Splinter rouses his students from their cold slumber and leads them to the snow-covered woods, where the battle will take place. In short order the TMNT are surrounded and attacked by the Foot soldiers, who vastly outnumber our heroes. In a quick and bloody battle, one of the TMNT loses his hand to a sharp blade. Splinter calls out to his other sons to save the hand. Once this accomplished, the ninjas retreat back into the forest. The Shredder allows his enemies to flee, stating that he is satisfied with this victory… for now.